This is our entire yield from this year (shorn of dead leaves and other detritus). It looks like quite a lot for a single dish when fresh but you will be surprised how the volume diminished when it is cooked. 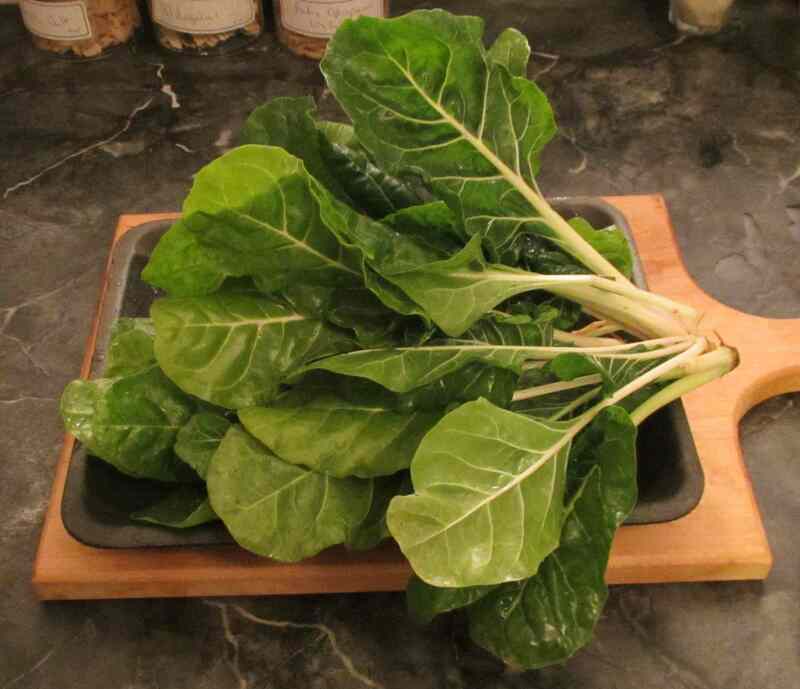 1 bunch Swiss Chard, leaves chopped coarsely, and stems finely. 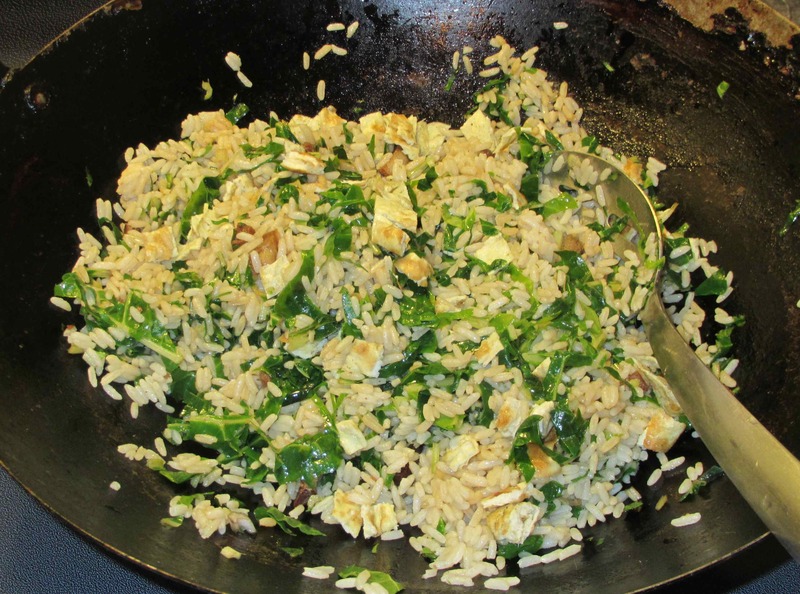 It is most important that, for fried rice, you use cold cooked rice and not rice that is freshly hot from the steamer or rice-cooker. Best of all, let the rice chill overnight in the fridge before you use it. First of all, beat your egg and then heat just a smidgen of oil on your wok. 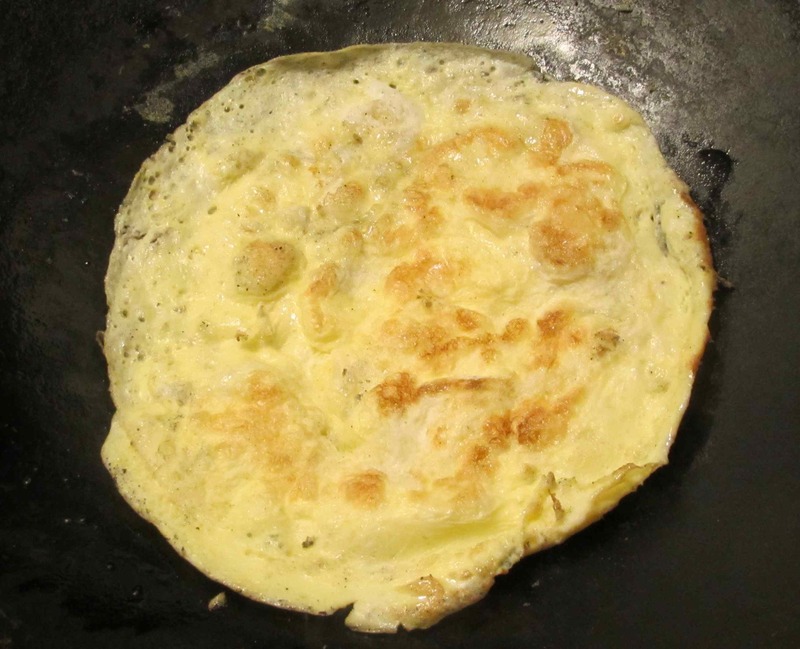 When the oil is shimmering hot, add the egg and swirl the pan to spread it out into a thin omelet. Allow it to brown, then flip it and repeat on the other side. When it is done, remove to a cutting board and chop it into small pieces. 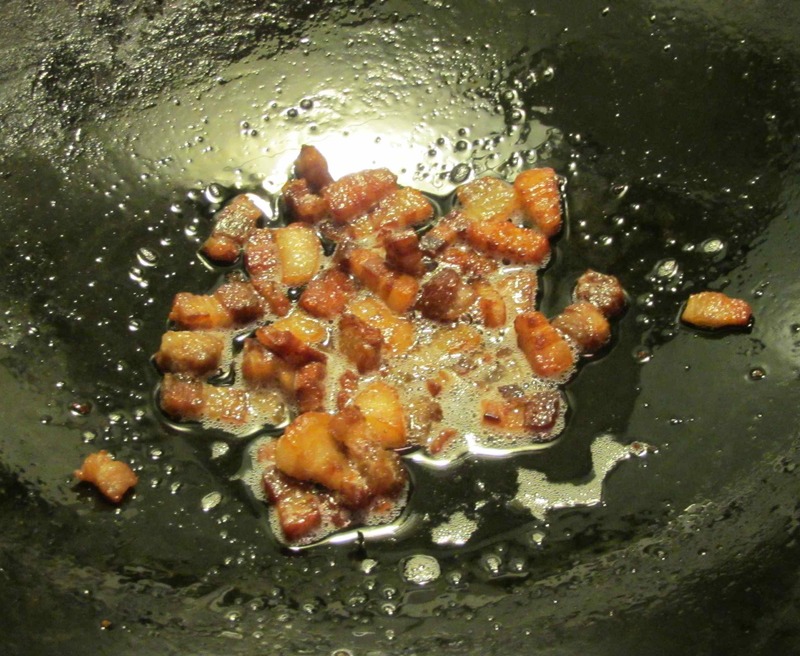 Add the pork belly pieces to the wok while it is still hot and stir fry until they are golden brown and getting crispy. Remove to a small receptacle and pour off all but a tablespoon of fat. 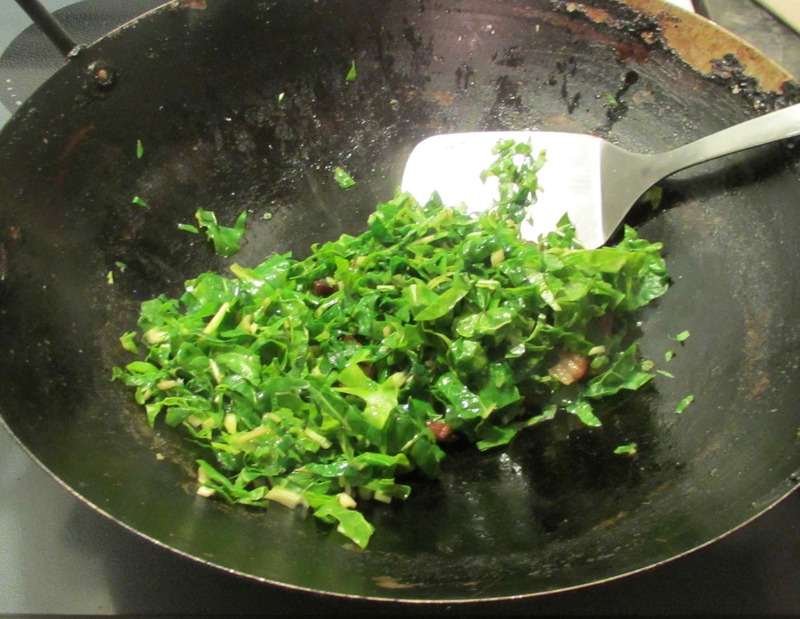 Add the chard and stir rapidly until it is bright green and wilted. Finally, add the rice and then the soy sauce. 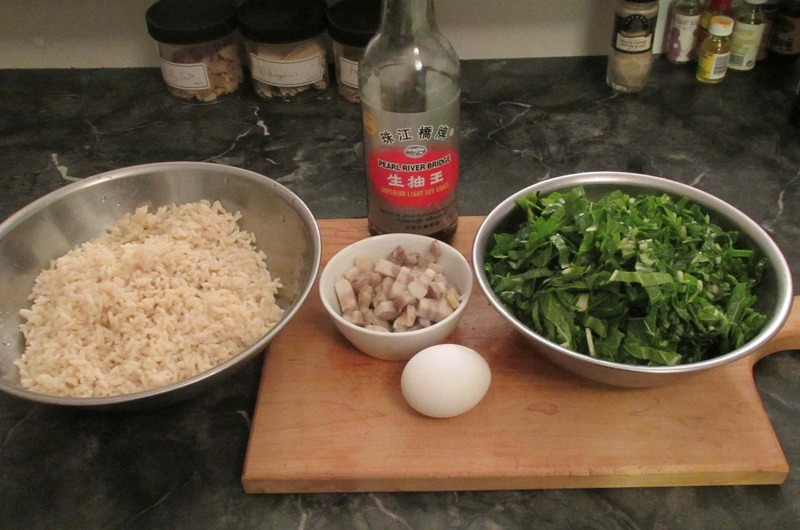 Stir until the soy is incorporated into the rice and then add the egg. Continue to toss and stir until everything is heated through and then plate and serve. It seems that you like pork belly a lot. It must be good taste…! Melts in the mouth. Actually, pork belly is the same cut as bacon which is a hugely common breakfast meal for many. We almost never eat bacon for breakfast so, in fact, we really don’t eat that much. Ha ha, the nutritionist would not agree with you. Anyway, ice cream has more calories than bacon! Using your comparison, pork belly is better than ice cream in terms of calories. I just made that up. Have a good afternoon. Eat ice cream! Could have made this with some of the ksle I grew. I could happily munch on this – scrumity. 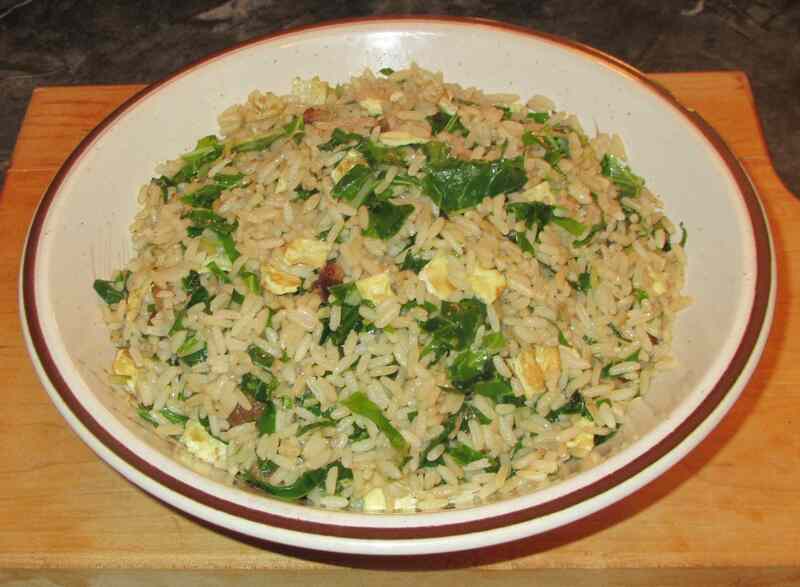 This is my kind of recipe – love fried rice. Great idea to add swiss chard too – I’m always trying to come up with ways to use it since it’s so healthy, and this is a great idea. I like Swiss Chard, but the problem is, whether you buy it or your grow it, you usually have way more than any mere mortal can tolerate and some always turns into a science project in the fridge. I’m not sure if I would have made fried rice with kale. But then I don’t use kale. If I didn’t eat it raw, I might have sauteed it with some onions.